In a recent article, we started exploring the world of cheaper Wacom drawing display alternatives to find usable solutions for our colleagues with limited financial resources. 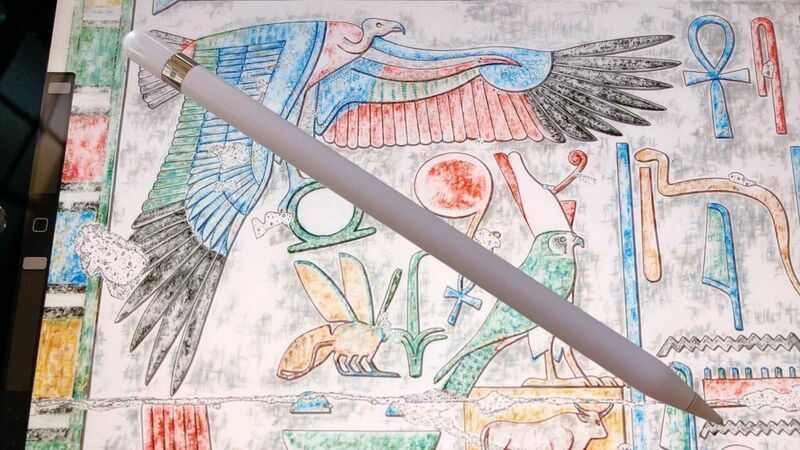 In the second part of introducing budget-friendly artist displays, digitalEPIGRAPHY would like to draw your attention towards yet another emerging company that was founded in Japan in 2005, called XP-Pen. Since 2013, they have been expanding into the North-American and European markets and more recently extended their presence into Asian as well. 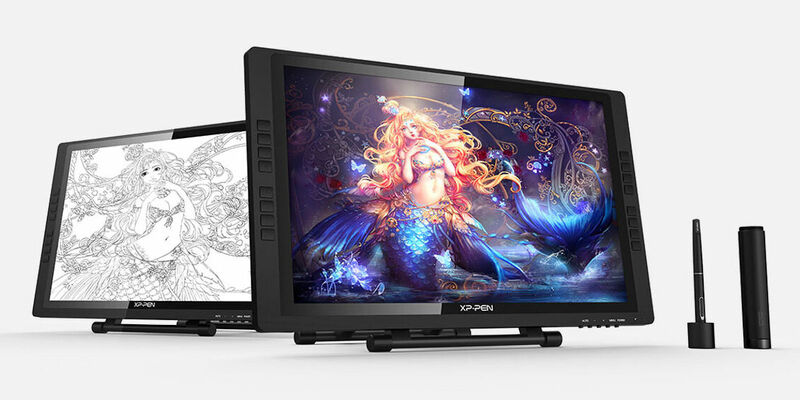 XP-Pen produces three different tablet lines, of which their Artist Display series is the one directed towards professional artists and designers. Their currently offerred screen sizes range from 12 inches all the way up to 22 inches, but our observations and recommendations are based on their 16 and 22-inch options (each has two different variations) that could be considered suitable for digital studio work. We must have it out immediately: only a few years ago, the idea that anybody could afford the technology that enabled them to draw directly on a computer screen seemed absurd. The only decent options were offered by Wacom, holding a price tag that was out of reach for most of us. Nowadays, one can choose from drawing on an iPad, a Surface Pro or an Android device, and there are more and more cheap solutions offering a Wacom-like experience competing to grab our attention when deciding on which hardware to pick for our studio (or even field) work needs. Starting with the XP-Pen Artist 15.6 graphics tablet, the cheapest of the four at $449: what strikes us is that there are no apparent compromises that come with the lower price tag. XP-Pen’s device is a slim and beautiful flat panel including shortcut buttons on the side, and it is rotatable to suit right or left-handed use of the shortcut keys. It connects to your Mac or PC via a single USB-C port and continues through a complex HDMI (an adaptor for Mini DisplayPort is provided) plus two separate USB cables (one for pen information and a second one to provide power). If you use a USB-C MacBook Pro, you’ll need an additional Digital AV Adapter that sets you back by another $69. The screen is matte and has a nice, paper-like feel to it, which makes drawing and painting on this tablet a pleasure, just like you’d expect when using a Wacom Cintiq. The HD IPS (1920x1080 pixels resolution with a 16:9 aspect ratio) screen size frees you to make expressive brush strokes, and the pen pressure sensitivity (including 8192 levels) is responsive enough to keep your lines flowing. 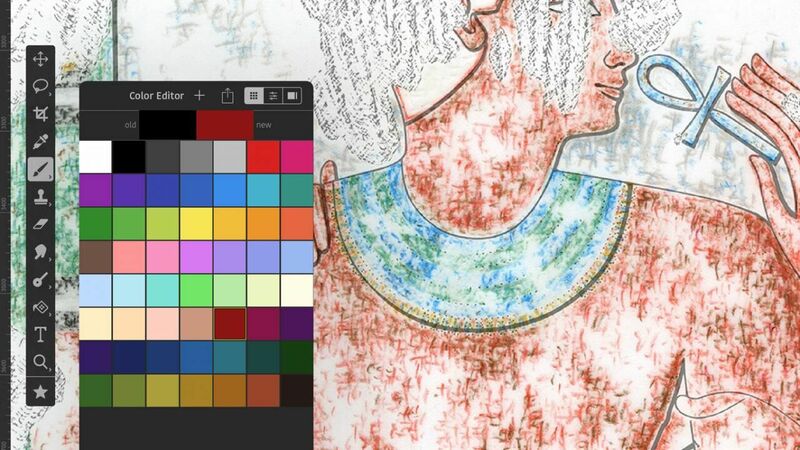 However, there is a minor setback when it comes to the drawing experience: there's a little too much visual offset between the point of the stylus and where the cursor appears on-screen. One can get used to it when sketching, but it makes laying down precise lines a little cumbersome. You also need to consider that there is no stand included in the box, therefore if you like inking on your screen at a slight angle, you need to purchase your own drawing stand. 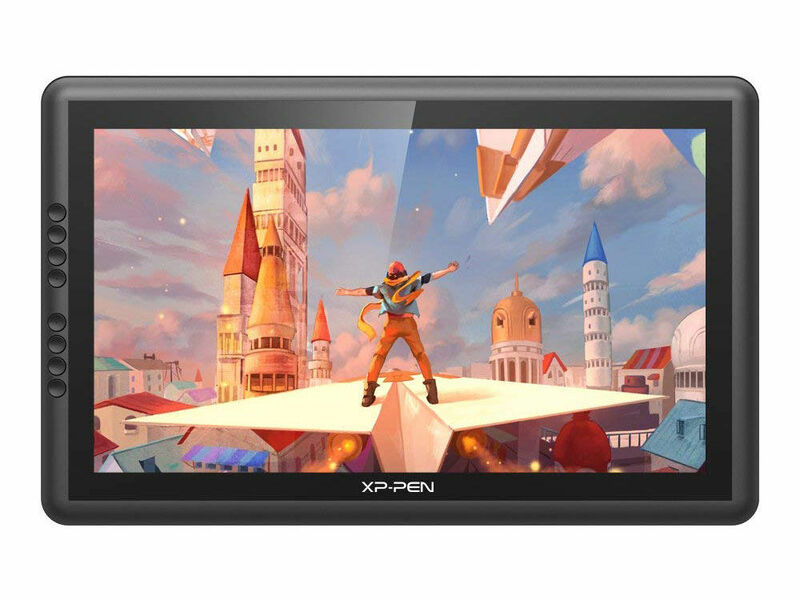 The XP-Pen Artist16 Pro ($499) provides the same 15.6 Inch screen real estate (1920x1080, 16:9) but has a higher quality display with stronger, more vibrant colors and the same anti-reflecting (removable and replaceable!) matte coating designed to reduce glare and provide a little more resistance for your brush strokes. The – surprisingly light - Pro display comes with a more advanced rechargeable (via USB delivering 130 hours of use on a single charge) stylus that produces the same 8192 levels of pressure but provides you with a more responsive and more sensitive touch, and overall a more fluid experience. It has two customizable buttons on the side and XP-Pen includes two of its pens in the box to make sure that you’ve always got a backup ready to go while the other one is charged or in case it breaks. A multi-function pen holder is also included to keep your pen and pen nibs safe. You can use it as a pen stand or a pen holder, taking it with you wherever you go. Speaking of stands: there is an ergonomically designed adjustable stand included with the Artist16 Pro (the display itself can be attached to a standard 75x75 mm Vesa mount). Regarding our previous concerns with jiggly brush strokes when using Huion drawing displays, we are happy to report that the Artist16 Pro doesn’t seem to have that problem. However, if you’re expecting the same gapless effect digitalEPIGRAPHY praised when reviewing the Wacom Cintiq Pro 16, we have bad news for you: all of XP-Pen's tablets have their drawing surface slightly above the screen, causing an inevitable parallax effec,t and the Artist16 Pro is no exception. Nonetheless, after working on the display for a few minutes it becomes barely noticeable, but we can see why some artists might have an issue with it. Finally, let’s look at the largest options XP-Pen has to offer, the Artist Display 22 Pro ($549) and the Artist Display 22E Pro ($599). 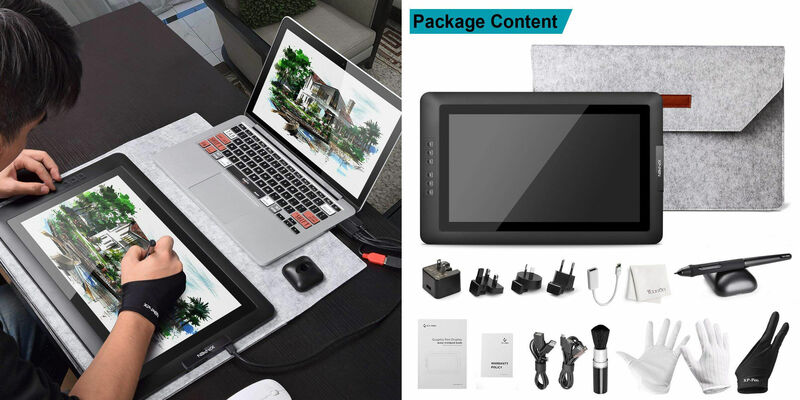 These tablets could be considered as a budget competitor to the Wacom Cintiq 22HD for those of our colleagues who’re looking for a large customizable drawing canvas for their studio work. The XP-Pen Artist 22E Pro is an update of the XP-Pen Artist 22 Pro with the main obvious change being the addition of programmable express keys. The 22E has two sets of keys, eight on each side providing shortcut buttons for left- and right-handed users as they mirror each other’s settings. Out of the box, the XP-Pen’s HD screen (1920 x 1080, 16:9) is brighter than the Cintiq 22HD, because it doesn’t have that matte coating Wacom uses to give its screens a paper-like feel. For the adventurous type, there is a screen protector included in the box that can be applied on the screen if desired. 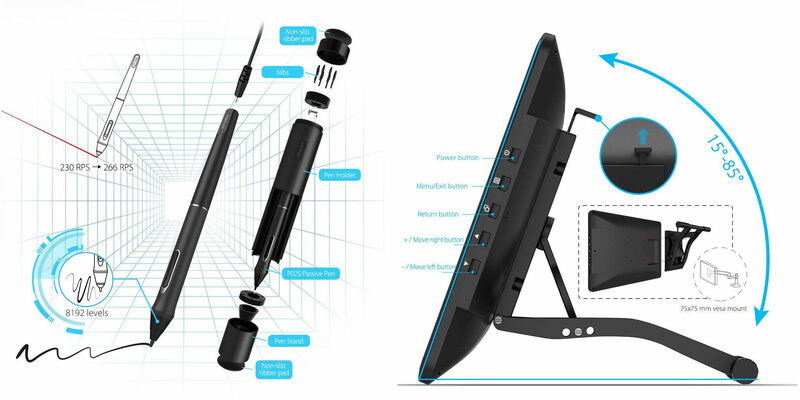 XP-Pen’s largest display also comes with a stand that is very sturdy and highly adjustable. A simple press on the lever on the back moves the display from almost straight up to nearly all the way down, in about 15 degrees increments. It doesn’t rotate, but it is also VESA-compatible and can be used with any mounting arm. We must conclude that although Wacom’s displays are obviously premium items made of premium materials, XP-Pen’s solutions are just as solidly built for the fraction of the money. Certainly, their user experience and feature sets can’t compete with Wacom’s fantastic new Cintiq Pro series, but they can be a solid choice when upgrading from older Wacom models such as the Cintiq 22HD. XP-Pen’s Artist Display Series can be purchased directly from the XP-Pen store starting at $449 for the Artist Display 15.6. During the lead-up to the Holidays, XP-Pen is running a $20-$30 discount on all models. Currently, some of their models are sold for considerably cheaper at Amazon.com where the Artist Display 15.6 is $359.99, the Artist 22 Pro is $399.99 and the Artist 22E is 499.99 at the moment. In Europe, XP-Pen’s artist pen displays are also sold at Amazon Germany and Amazon UK among many other retailers.